In ground irrigation systems are truly an investment in the health of your lawn and landscape. A properly designed sprinkler system will provide you with years of service and your landscape will thank you in return. As with any project a proper plan is required to ensure that the job goes smoothly. We will meet with you to discuss specific needs for your property, then design an irrigation system tailored for your landscape. All of our irrigation systems are installed using a vibratory plow. This machine provides minimal disruption to your existing lawn areas, and any required digging is done by first removing existing sod and replacing it when completed. We only install high quality professional grade sprinkler system parts from Hunter and Rain Bird. To help make your sprinkler system as efficient as possible, all of our irrigation systems come with a rain sensor wired directly into the timer, and a backup battery installed to prevent loss of settings during power outages. Never worry about wasting water again! Every spring we will turn-on test and adjust your irrigation system for optimum efficiency, and install a fresh backup battery into the timer. 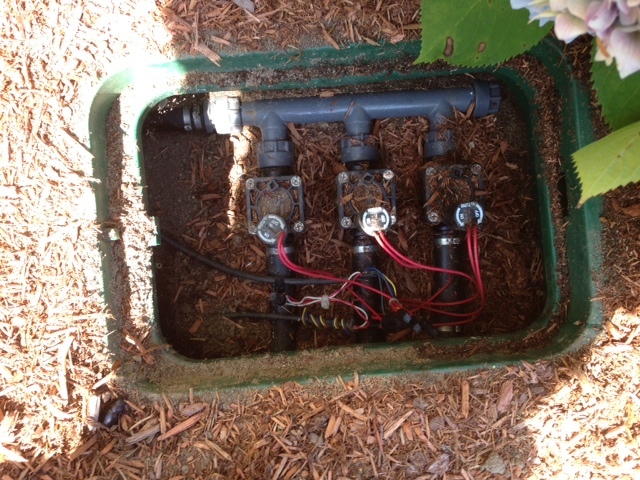 Every fall we shut down, back-drain and winterize irrigation system for the winter. Should you encounter a problem during the running season, Meyer Landscapes provides irrigation service for any irrigation system that we, or any other contractor has installed. All irrigation systems we install carry a one year warranty on parts and labor. Call us today for a free estimate!